"KEAP1 and Nrf2 PDB image"
Prx's are mostly found in the cytosol (also found in mitochondria, chloroplasts, and peroxisomes). Prx's exhibit antioxidant behavior through peroxidase activity, reducing organic hydroperoxides. Many cancer cells and tissues show increased expression levels of both Prx1 and Prx2. Expression of both Prx's in cancer cells has been associated with increased resistance to standard cancer treatments. Prx1 expression may be used as a predictive indicator of relative risk of death or patient survival among cancer patients. 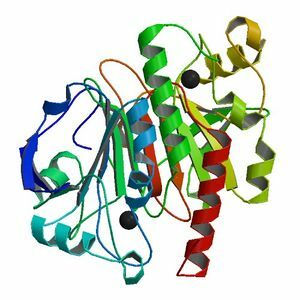 Prx1 may be useful as a new therapeutic target in cancer treatments. Under normal conditions, low amt of Nrf2 is maintained by the Keap1-mediated (KEAP1 = Kelch-like ECH-associated protein 1) ubiquitination and proteasomal degradation system. "Many Nrf2 activators are capable of modifying the thiol (-SH) of cysteine, thus leading to the idea that the reactive Cys residues in Keap1 may function as a redox sensor. The oxidation/modification of these reactive Cys residues in response to electrophile or oxidative stress my allow Nrf2 to dissociate from Keap1"--other studies disagreed...still unknown. Maybe phosphorylation of Nrf2 to be released from Keap1. For overall cancer treatment, cells with increased expression levels of Prx1 could be targeted with therapies that inhibited Prx1 expression. Our idea: we want to find Nrf2 mutants with higher binding affinity to prx1 promoter, but result in decrease expression of Prx1. 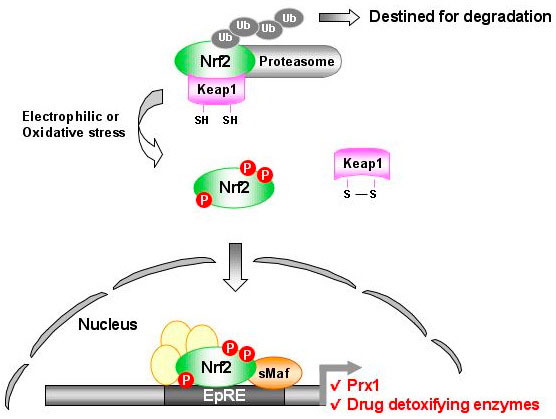 The idea is that such a mutant could be used to competitively inhibit the binding of wild type Nrf2 in cancer cells to the Prx1 promoter, and result in decreased expression of Prx1. We are still confused about how during phage display individual phage with different mutants attached could be isolated. Most papers just say "phage mutants were isolated" but do not explain how. Elution with complement promoter sequence? 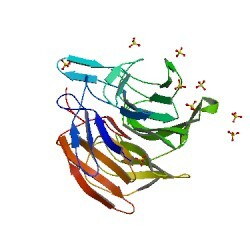 Elution using G/B Binding Buffer I? We will isolate mutants of Nrf2 that show decreased transcriptional activation of Prx1 compared to wild-type. If mutants show decreased Prx1 expression, we believe they do so due to decreased transcriptional activity but equal or higher binding affinity that WT. We never actually calculate binding affinity, so we can’t say for certain that these mutants have the higher binding affinity that we desire. Though, because of the way we isolated these mutants, we do know that these mutants still bind to the Prx1 promoter. Therefore, any mutants that show decreased Prx1 expression do so because of a loss of function and not a lack of binding to the promoter. If no mutants show decreased Prx1 expression, our random mutagenesis affected neither binding nor function of the protein. Therefore, we would do more rounds of mutagenesis to obtain more mutants. Since shutting off the function of a protein may be difficult, if we find that even with many rounds of mutagenesis we can’t isolate mutants with lost transcriptional function, we could shift our attention to other targets of Nrf2. Since Nrf2 is known to bind to many antioxidant proteins, we could test if any of our mutants showed lost transcriptional activity for those genes. Now, we want determine if these mutants have greater binding affinity compared to WT and therefore show the competitive inhibition phenotype we seek. If we see mutants that show decreased Prx1 expression when incubated with wild-type Nrf, we believe this was due to the mutant with decreased transcriptional activity competitively inhibiting binding of WT to Prx1. These mutants will have the phenotype we intended to create. We would make more copies of the DNA that encoded this mutant and perform binding measurements (??) on it to make sure that its effect was due to tighter binding that Prx1. We could also take these mutants and do more rounds of mutagenesis(random or site-directed) to refine its characteristics. Our mutant can’t effectively compete with WT Nrf due to equivalent or weaker binding (thus it can be displaced by WT). Still these mutants would be useful to us since they have lost transcriptional activator function. At this point, we would probably use SDM at the binding interface in order to introduce changes to make it a better competitive inhibitor. If our experiment is successful, it will result in the discovery of an Nrf2 mutant that has lost its transcriptional activator function for Prx1 and can competitively inhibit binding of wild-type Nrf2 to the Prx1 promoter. The discovery of such a protein may have applications in gene therapy or drug delivery techniques for cancer cell targeting. Once sequenced, the DNA encoding the mutant protein can be introduced into cancer cells. Since the modified protein works by inhibiting the function of the wild-type protein, replacement of the wild-type gene (by homologous recombination with the mutant gene) shouldn’t be necessary. If the Nrf2 protein produced from the DNA carries out its function in vivo as it did in vitro, Prx1 expression will be shut down in the cancer cells, leading to decreased resistance to standard chemotherapeutic treatments. Therefore, our modified protein can provide a way for increasing the effectiveness of cancer treatments in cancer cells where Prx1 expression is upregulated. "Up-regulation of peroxiredoxin 1 in lung cancer and its implication as a prognostic and therapeutic target." "Structure, mechanism and regulation of peroxiredoxins." "Oxidation of archaeal peroxiredoxin involves a hypervalent sulfur intermediate." "Identification of tumor antigens that elicit a humoral immune response in breast cancer patients' sera by serological proteome analysis (SERPA)"
"Taenia solium: antioxidant metabolism enzymes as targets for cestocidal drugs and vaccines." "Peroxiredoxins, a novel protein family in lung cancer"
"Involvement of peroxiredoxin IV in the 16alpha-hydroxyestrone-induced proliferation of human MCF-7 breast cancer cells." "Inhibition of lung tumor growth and augmentation of radiosensitivity by decreasing peroxiredoxin I expression"
"Identification of the functional role of peroxiredoxin 6 in the progression of breast cancer." "Human prx1 Gene Is a Target of Nrf2 and Is Up-regulated by Hypoxia/Reoxygenation: Implication to Tumor Biology"
"Bach1 Competes with Nrf 2 Leading to Negative Regulation of the Antioxidant Response Element (ARE)-mediated NAD(P)H:Quinone oxidoreductase 1 Gene Expression and Induction in Response to Antioxidants*"
GOOD IMAGES"Targeting the Nrf2-Prx1 Pathway with Selenium to Enhance the Efficacy and Selectivity of Cancer Therapy"
This page was last edited on 2 September 2011, at 08:53.